“Servaj” (pronounced: Ser-vai) is Piedmontese dialect, for both “wild” and “creative”, a name chosen for this new and young wine from Marchesi di Barolo. Dolcetto is one of the most characteristic grapes of Piedmont, a region famed world-wide for top-quality red-wine production. The name means “little sweet one”, due to the grape’s low acidity, relative to other red grapes from the region (Nebbiolo and Barbera). Terroir: Grapes are sourced from the best Dolcetto vineyards in the Langhe (Barolo, La Morra, Alba e Castiglione Falletto). These hillside vineyards are located on soils with a rich presence of quartz, sand and limestone and are the source of the wine’s fresh and fruit-forward aromas. Yields are 60 hectoliters per hectare and harvest generally occurs in the first two weeks of September. Vinification: Hand-picked grapes are brought to the winery in perfect condition and are de-stemmed and softly pressed before vinification. Fermentation lasts five days, after which the wine racked and kept in stainless steel tanks where it remains before bottling. 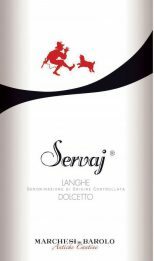 Servaj sees no oak ageing, which is traditional for Dolcetto in order to maintain the freshness and purity of fruit. Servaj is bright ruby-red in color with violet notes and distinctive maraschino cherry aromas. This fresh, medium bodied wine with a velvety feel on the palate is excellent on its own due to the low acidity and also pairs well with cured and light meats and pasta with tomato-based sauces. "Though tight and linear, this red evokes raspberry jam and macerated cherry flavors. Vibrant, leaving a mouthwatering impression on the finish. Drink now. "